Economists typically presuppose environments where a state enforces property rights and contracts (Grossman 1999). 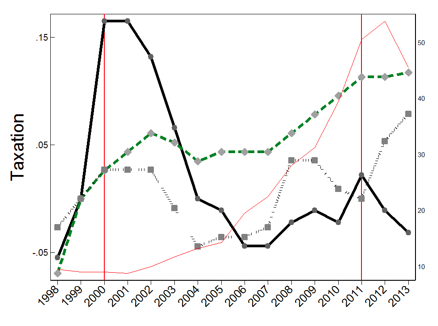 However, history suggests that states typically appear late in the development process (Bates et al. 2002). Research on state formation suggests that states are essentially a “monopoly of violence” (Weber 1946, Carneiro 1970) and that their precursors are protection rackets created by armed actors (Tilly 1985) whose behaviour can be explained by the logic of expropriation, much like Olson (1993)’s “stationary bandits.” Only much later do states develop other functions such as a welfare state, which are familiar in the current collective imagining of the state. To address this challenge, in a recent paper I designed a data collection system to observe historically the behaviour of armed actors in eastern Democratic Republic of the Congo (DRC) (Sánchez de la Sierra 2017). Eastern DRC offers a suitable empirical setting, because the central state has largely withdrawn from large areas of the territory. This led armed actors to often engage in arbitrary expropriations, but also to often develop basic state functions. Using variation in the economic conditions faced by armed actors, and in the degree to which they create the basic state functions, I attempt to isolate the economic causes (expropriation) that led them to develop the basic functions of states. Using these data, I propose an explanation for why armed a stationary bandit might create a monopoly of violence in a given location. Based on the project's qualitative fieldwork, the economics of taxation suggests that the value of output that can be taxed increases the returns to forming a monopoly of violence in the location where such output is produced and traded. In contrast, when output is valuable but cannot be taxed, this leads armed actors to develop more sophisticated strategies to tax the population instead (consumption, income, and any other activity that might reflect higher income). This leads them to create fiscal and legal administrations in the locations where the population and families live. Unusually, the setting means it is possible to demonstrate this relationship empirically. Villages in eastern DRC have resources that vary in both their value and physical properties. Some villages are linked to columbite-tantalite deposits (coltan), a bulky mineral whose output is easy to tax; others are linked to gold deposits, a hard-to-find mineral whose output, and miners can systematically conceal it. To establish that increasing output value changes the strategies used by armed actors, and that it does so differently depending on how easy it is to tax the output, I exploit unusual mineral demand shocks. In 2000, Sony announced that its PlayStation II, which uses processed coltan, would go on the market for Christmas. 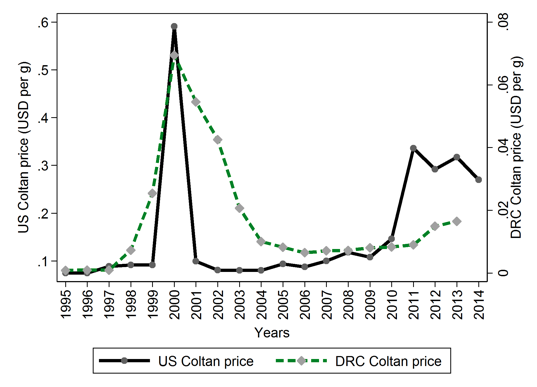 The price of coltan skyrocketed from $90 to $650 per kilogram, and remained at this level for the entire year (Figure 1). A similar demand shock for gold, resulting from 9/11 and the rush to gold as a safe haven, took place in 2001. 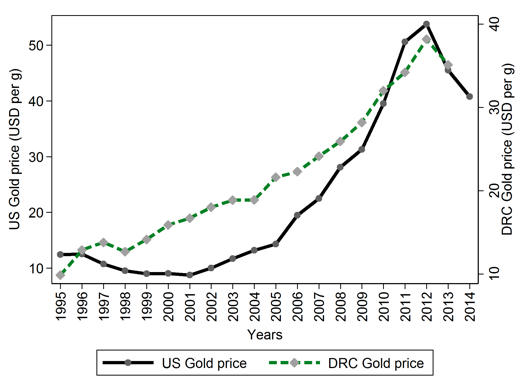 Source: US Geological Survey (US prices) and Sánchez de la Sierra 2017 (DRC prices). As a foundation for this study, I deployed data collectors in 650 locations of eastern DRC that vary in their mineral endowments. In each location, these data collectors assembled a yearly dataset on the behaviour of armed actors since 1995: detailed accounts of violence, their presence, duration, taxation, services and details of how they governed. Data collectors conducted an immersion in each village for a full week, where they conducted five hour-long interviews in private in eight households to reconstruct family and the village history, a series of qualitative interviews, and a village qualitative report. In each village, the data collectors also created and monitored a local team of history experts, who gathered independently the same village historical information every day. After a week of data gathering, the data collectors reconciled the data sources to reconstruct the village history (Figure 2). Source: Sánchez de la Sierra (2017). Notes: Villages linked to at least one coltan mine are marked with a circle and red cross. Villages linked to at least one gold mine are marked with a gold circle. Villages linked to no gold or coltan mines are marked with a purple diamond. Airplane symbols indicate local airstrips. A team of two surveyors worked during seven days to reconstruct the year-level history of the support village and all associated mining sites. The first result is that the coltan shock gave rise to the essential functions of the state (Tilly 1985) on the extensive margin – taxation, protection, and monopoly of violence. 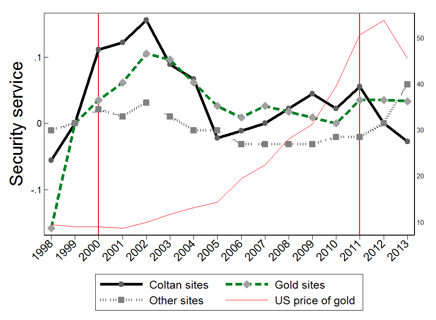 The proportion of coltan mines with stable taxation, an active stationary bandit, and where armed actors provided security rose significantly, but stagnated in all other mining sites (Figure 3). This effect occured mostly near airports, precisely where coltan was traded to world markets. This transformation parallels the trajectory of the English state, which derived most revenues from taxes on international trade, which was easy to tax with customs (Ardent 1975). Notes: This figure presents the proportion of sites where stable taxation exists, where a bandit is stationary, and where security services take place in deviations from 1999 levels. The solid line, the dashed line, and the dotted line respectively indicate the proportions for coltan, gold, and other production sites. The second result is that this extensive margin effect did not occur in gold production sites (mines) in response to the gold shock. Instead, an extensive margin effect occurred in the villages where gold miners and their families live and consume, which on average are several days' walk away. Armed actors used sophisticated taxation efforts in these villages (Figure 4). They created taxes on transit, consumption, head taxes, as well as fiscal and legal administrations to manage tax evasion and enforce contracts (intensive margin). This transformation parallels the trajectory of state development in France. Its sophisticated fiscal administration developed to raise revenue from small, difficult-to-observe transactions in the interior of the country, in contrast to the trajectory of the English state (Ardant 1975). Notes: Panels A, B, C, D, E, and F show respectively six dimensions of armed group’s rule: fiscal sophistication (extraction), administration, economic regulation, legitimation, public service, and political power. The values indicate the proportion of village*year observations, where a bandit was stationary, in which each of the outcomes was recorded. There were 3,818 village*year observations. The outcomes varied from year to year within a stationary bandit episode. 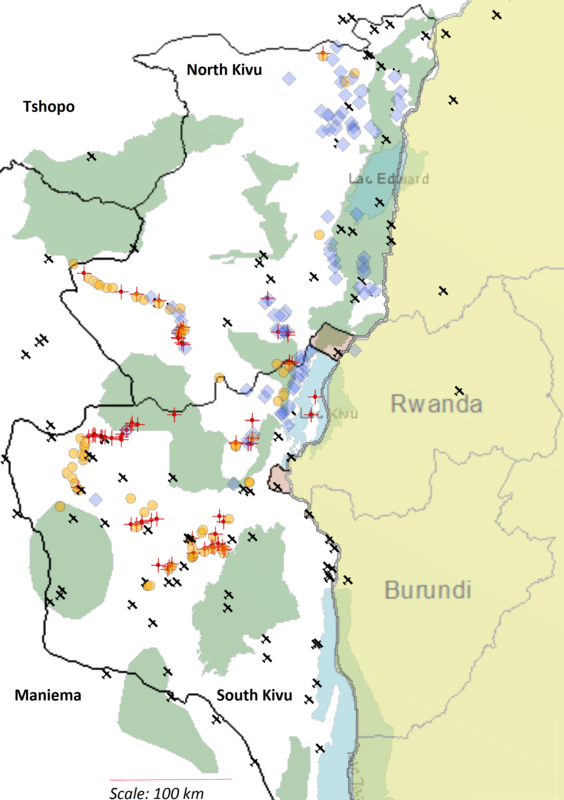 “*” signifies outcomes for which the data were collected in North Kivu only. My third result is that that price shocks translated into higher surplus only when a stationary bandit was present. However, they translated into higher household welfare only when the stationary bandit was a local popular militia. Absent stationary bandits, or when a external stationary bandit was present which had no ties to the population, households did not appear to benefit significantly. Mine is one of the first empirical assessments of the causes that underpin the emergence of state functions. It provides new insights into state formation. First, the historical process prior to the current period abounds with examples of armed organisations aiming to govern territories. The most successful of these ended up forming states, but many of these states-in-the-making then disappeared (Tilly 1985). Thus, my findings suggest that civil war studies focusing on armed actors in today’s ungoverned territories often overlook their relevance to the process of state formation. Second, while I find that the transformations first described for the “early” state formation process (creation of a monopoly of violence, territorial conquest, emergence of taxation and tribute) can arise when the value of taxable output increases, I also find that its sophistication (development of a fiscal and legal administration) takes place in populations that have high income, but where output cannot be taxed with taxes on output and trade. Third, voluntaristic and conflict theories of the state – two major opposing views for the origin of the state – enjoy little support due to the absence of data. I provide evidence that higher taxable potential surplus triggers the emergence of both processes (popular militia versus external armed actors). Furthermore, I find that that household welfare benefits only with popular militia. My paper also contributes to the civil war literature and makes minor contributions to the resource curse literature, which I describe in the paper. As Blattman and Miguel (2010) conclude, the study of civil war is limited by poor data. I addressed this challenge by designing a measurement strategy that assembled a large disaggregated data set of armed groups’ behaviour. 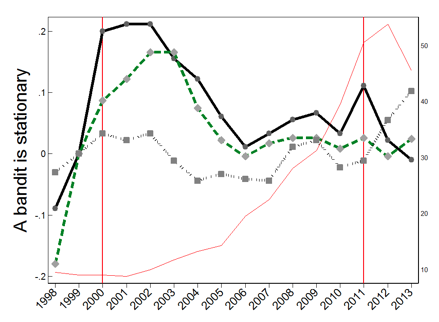 Using these data, I provide a previously unexplored role for taxation (Dal Bó and Dal Bó 2011, Dube and Vargas 2013) – namely, that demand for a labour-intensive commodity increases violence between groups, but when labour income can be taxed, this might lead to the emergence of state functions. Ardant, G (1975), “Financial Policy and Economic Infrastructure of Modern states,” in Charles Tilly and Gabriel Ardent (eds), The Formation of National States in Western Europe, Princeton University Press. Bannon, I and P Collier (2003) “Natural Resources and Violent Conflict: Options and Actions”, number 15047 in World Bank Publications, The World Bank. Bates, R, A Greif, and S Singh (2002), “Organizing violence,” Journal of Conflict Resolution 46(5): 599-628. Blattman, C and E Miguel (2010), “Civil War,” Journal of Economic Literature 48(1): 3–57. Carneiro, R L (1970), “A Theory of the Origin of the State,” Science 169(3947): 733-738. Claessen, H and P Skalnik (1978), The Early State, New Babylon: Studies in the Social Sciences, De Gruyter. Dal Bó, E and P Dal Bó (2011), “Workers, Warriors, and Criminals: Social Conflict in General Equilibrium,” Journal of the European Economic Association 9(4): 646–677. Dube, O and J Vargas (2013), “Commodity Price Shocks and Civil Conflict: Evidence from Colombia,” The Review of Economic Studies, 80(4): 1384–1421. Grossman, H I (1999), “Producers and Predators,” National Bureau of Economic Research working paper 6499. Hirshleifer, J (1995), “Anarchy and Its Breakdown,” Journal of Political Economy 103(1): 26-52. Michalopoulos, S and E Papaioannou (2013), “Pre-Colonial Ethnic Institutions and Contemporary African Development,” Econometrica 81(1): 113–152. Olson, M (1993), “Dictatorship, Democracy, and Development,” American Political Science Review 87(3): 567-576. Sánchez de la Sierra, R (2017), “On the Origin of States: Stationary Bandits and Taxation in Eastern Congo,” Working paper, University of California Berkeley. Scott, J C (1998), Seeing Like a State: How Certain Schemes to Improve the Human Condition Have Failed, Yale University Press. Tilly, C (1985), “War Making and State Making as Organized Crime,” in Theda Skocpol Peter Evans, Dietrich Rueschemeyer (eds), Bringing the State Back In, Cambridge University Press. United Nations Security Council (2002), Final Report of the Panel of Experts on the Illegal Exploitation of Natural Resources and Other Forms of Wealth of the Democratic Republic of Congo, United Nations. United States Geological Survey (2016), Historical Statistics for Mineral and Material Commodities in the United States, Data series 140. Weber, M (1946), “Politics as a Vocation,” in H H Garth and C Wright Mills (eds), Essays in Sociology, Macmillian.